If you have read any of my last articles on HVAC ducts you recognize that, like the HVAC units, the duct network is a system as well. 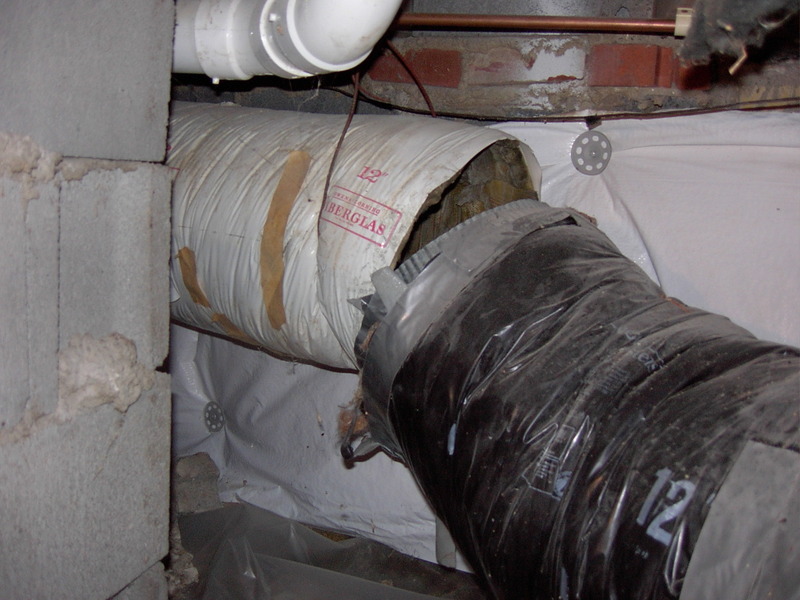 In the past I was an advocate of reinsulating the existing ducts over replacing them because of the cost. However, I am changing my tune as I continue to see more and more duct systems that were either so poorly installed from the get go or they have been patched, damaged or added to (incorrectly) they weren’t worth saving. On my most recent project, I found the return air plenum was sucking return air right off the dirt floor in the crawl space. Some people might say “it just smells like an old house”; trust me, even an old house shouldn’t smell musty if the system is in good condition. For the most part, properly installed ridged system can be superior, but if not, they stink. 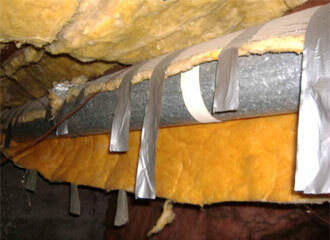 One of the biggest problems with ridged duct systems are: They are ridged! Just like the biggest problem with flexible ducts are; they are flexible! As with any house construction there are lots of obstructions that have to be dealt with. The flexible ducts are great for these applications as they can be easily routed around structural beams. However, all turns and bends should be gradual and smooth. No kinks or sharp turns. One of the most disappointing things I see in residential construction is what I call “the lack of trade respect”. Think of it like fighting siblings, the older brother is always going to pick on the younger brother, just cause he can. Time and time again, I find shoddy work that is caused by a sibling trade. In a recent remodel project, we found that the HVAC contractor purposely removed several supporting beams because: they were in his way. In turn, it was left that way and didn’t show up until the roof was replaced some 40 years later. The roofers couldn’t re-deck the roof because of 6 split rafters, in other words, the roof was caving in. Admittedly, the workers are long gone but the negative effect of their work lives own. The rafters had to be rebuilt and purlins had to be replaced. Though our investigation, it was obvious that the HVAC tech removed them so he could have a straight path for his ridged duct. Negatively impact the integrity of the house was trumped by his laziness or willingness to cut corners. As with most attic or crawl space work, there is no one checking their work. 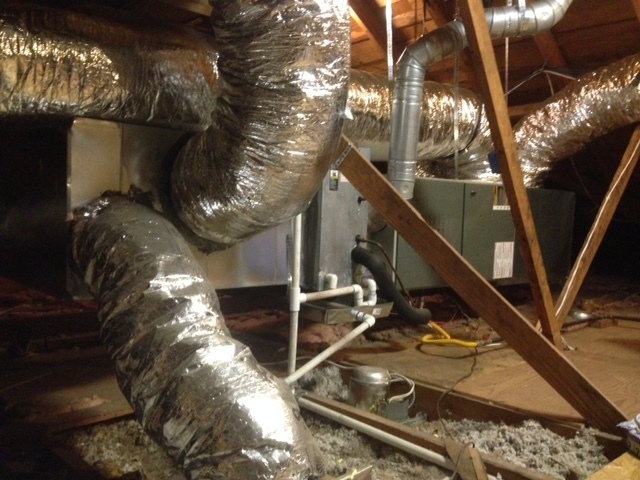 Its not uncommon to find a 50 year old house that has had new HVAC units installed multiple times but the ducting is still 50 years old. Granted, when an HVAC unit fails to work, the problem is the units not the ducting. As the homeowner it is easy to just have the units replaced and leave the ducting as is since the new ducting can be as expensive as the unit itself. Unfortunately you can easily be giving up some of the efficiency gained by replacing the units. To learn more about “Improving the Efficiency of Your Duct System“, I have attached a link to a paper written for the US Department of Energy by Brookhaven National Laboratory. After reading the article and you realize it is time to replace the ducting, look to schedule the work in off-peak months. You will probably get a little better deal and a lot better job. You are currently browsing the Homeownerbob's Blog blog archives for December, 2016.